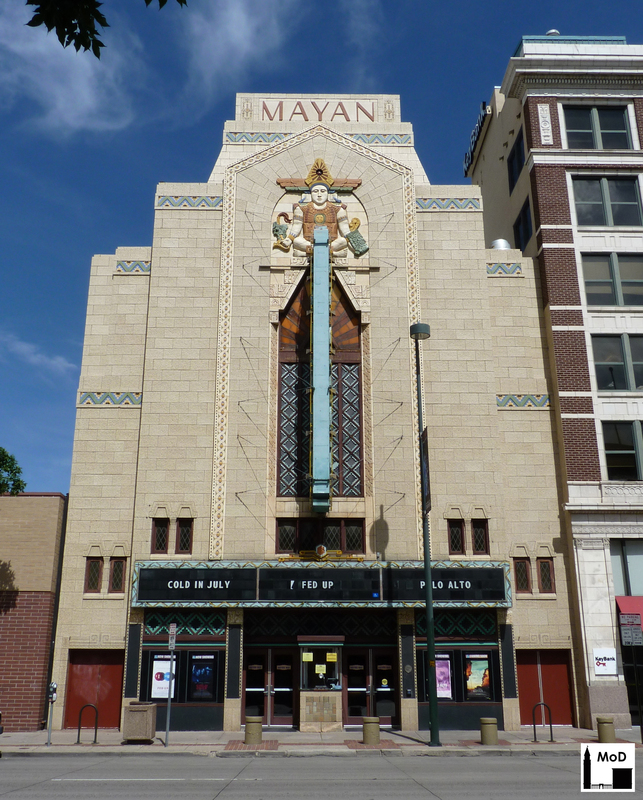 The Mayan Theater is one of Denver’s most beloved movie theaters because of its unique architectural features. Built in 1930, it was designed by architect Montana S. Fallis and is clad in polychrome terra cotta produced locally by the Denver Terra Cotta Company. Over time, the building fell into disrepair and by the 1980s was threatened with demolition. Just before demolition could occur, however, the building was designated an individual landmark by the Denver Landmarks Preservation Commission and was eventually restored by Midyette/Seieroe & Associates in about 1986. I think this building has some of the best architectural terra cotta in a city full of gorgeous terra-cotta buildings. 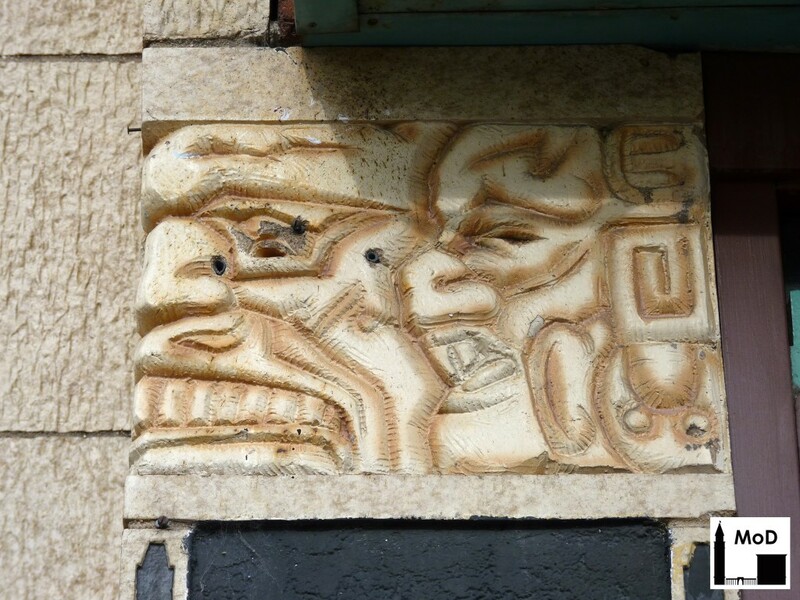 Take a look at the building’s Pre-Columbian design. I don’t know much about Mayan iconography, but the quality of the terra cotta is quite remarkable. The fabricators used several different glaze colors to make up borders and the god figure above the vertical sign. The sculptors were also creative in dividing the god’s features into individual units so that he still reads as a single figure. For example, the snake or shaft feature in the god’s right hand (our left) is made up of three individual units that extend from the outer border to the edge of the god’s arm, the bottom unit including his hand. The god’s breastplate alone is made up of about six units. You can click on the photo above to look at the terra cotta in greater detail. The texture of the terra cotta is also really interesting. Most terra cotta was molded into flat units, but a lot of the terra cotta produced in Denver in the 1920s and 1930s had a rippled texture like that used at the Mayan. 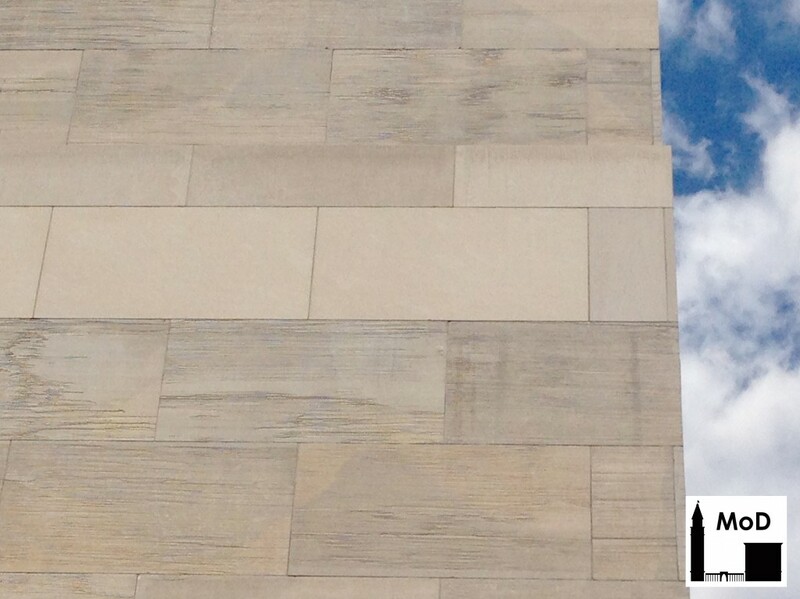 This rough texture and variegated glaze – a cream base with light brown and orange-brown highlights – mimicked natural sandstone such as the one used at the Lindsey-Flannigan Courthouse designed by klipp Architecture Planning Interiors and opened in 2010 (photo below). 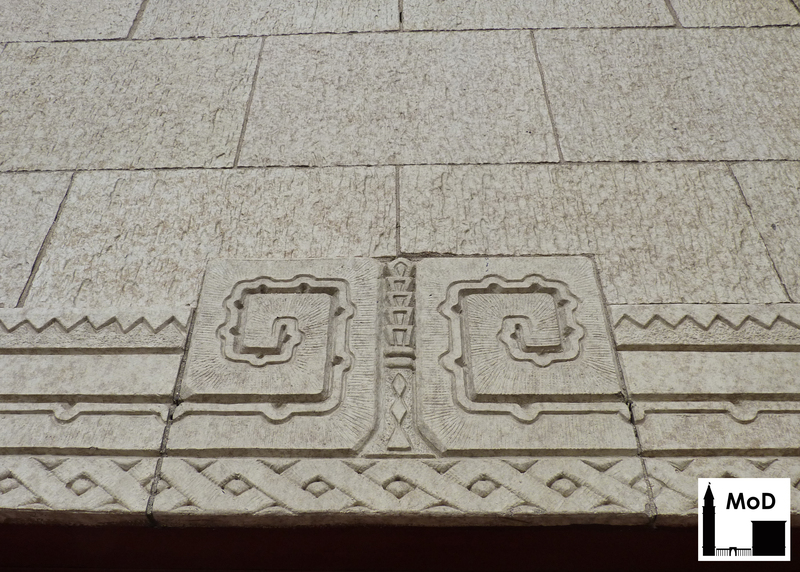 The terra cotta at the Mayan Theater was oriented with vertical faux ‘bedding planes’, while sandstone used on the courthouse masonry was oriented with horizontal bedding planes. The faux ‘bedding planes’ in the terra cotta of the Mayan Theater enhances the verticality of the building. 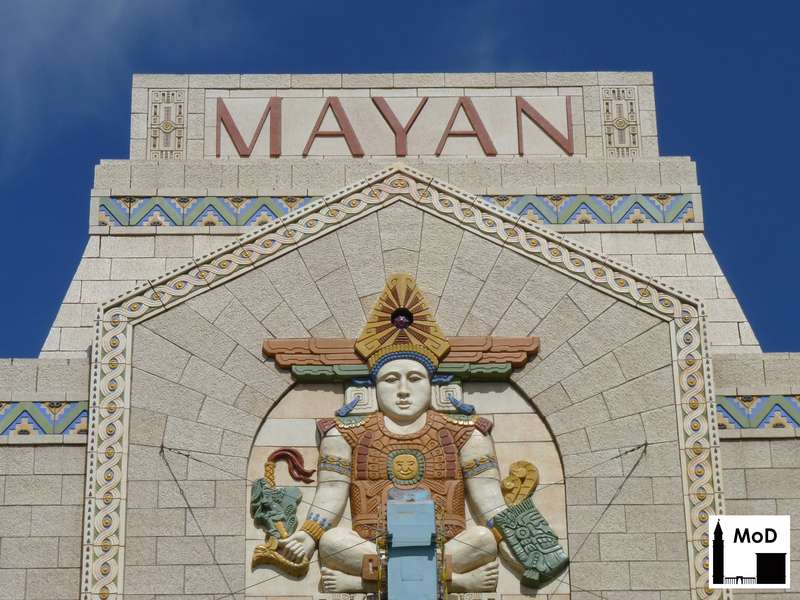 Although the Mayan Theater was restored nearly thirty years ago, it remains in excellent condition. 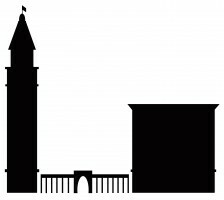 A few small spalls and chips can be found on the terra cotta, especially toward the base of the building, but these minor areas of deterioration do not detract from the incredible masonry of this 84-year-old building.